11. You know that Field 5 at Robert Moses Beach is for families, Field 2 is where the cool people go and Field 3 is for losers. 10. You know not to feed the deer! 9. Keep your Hamptons share house, we’ll be on the ferry to Fire Island. 8. You know Lyme Disease is no joke. Deer ticks, like these, transmit Lyme disease to humans, including Long Island residents. 7. You know Ralph Macchio lives here. 6. You know there’s a suburban legend of a vengeful princess at the bottom of Lake Ronkonkoma waiting to claim another male. Lake Ronkonkoma, Long Island’s largest lake. 5. That the real mall is in Huntington. 4. You know where the sidewalk ends. 3. We root for the Long Island Ducks. 2. East Northport is actually south of Northport. 1. 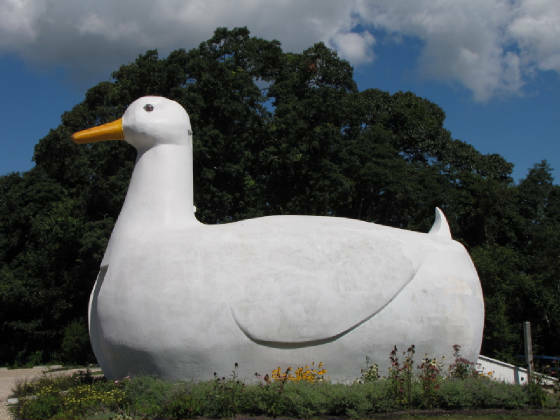 Our duck is bigger than your duck.